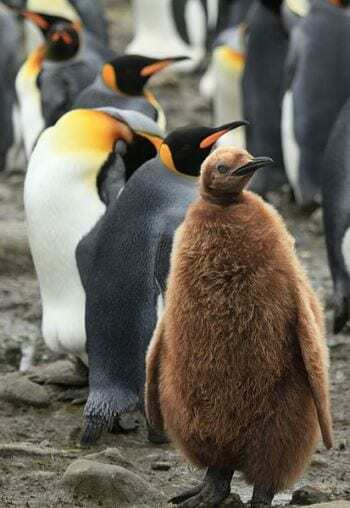 The king penguin (Aptenodytes patagonicus) is the second largest (after the emperor penguin) of all the penguin species, standing nearly a metre tall and weighing up to 17.3 kilos. 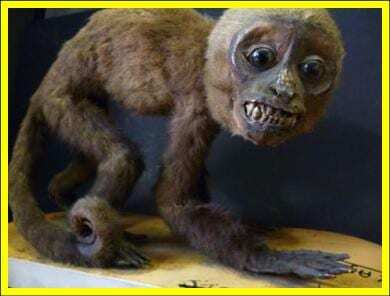 They breed in colonies, which can number in the tens of thousands, and are found on the islands surrounding the Antarctic mainland, known as the sub-Antarctic. We know that our egg was collected in 1954 on South Georgia, a 104-mile-long, British overseas territory in the southern Atlantic. They are voracious fishers, and swimming at approximately 12 km/h a hungry penguin can travel up to 500km to feed. They eat a range of small fish species but will also tuck into a squid from time to time. The king’s breath is a big one. While diving they can easily remain submerged for ten minutes and reach depths of over 300 metres. 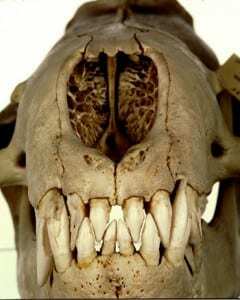 LDUCZ-Z1125 leopard seal (Hydrurga leptonyx) skull – note the teeth! King penguins are good eating and serve as prey for a variety of the southern seas’ seal species. This includes the local fur seals (Antarctic and sub-Antarctic) as well as the better-known leopard seal. They also make a nice snack for a passing orca and as juveniles fall prey to large sea birds, such as brown skuas and giant petrels. 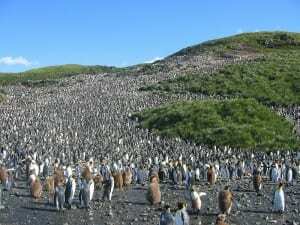 The king penguin population seems to be relatively unaffected by this, however. Numbers are actually increasing. In the sea of black and white (and a little bit of orange) that is a king penguin colony, it can be hard to find a partner or a parent – at least by sight. Most birds have a syrinx, which sits at the junction of the bronchi and acts as a (normally) two-part voice box. It seems that in the king penguin the interplay between the two notes produced by this organ is unique to an individual and provides a sort of sonic signature that allows them to identify themselves in the crowd. Scientists call this “the cocktail-party effect”. 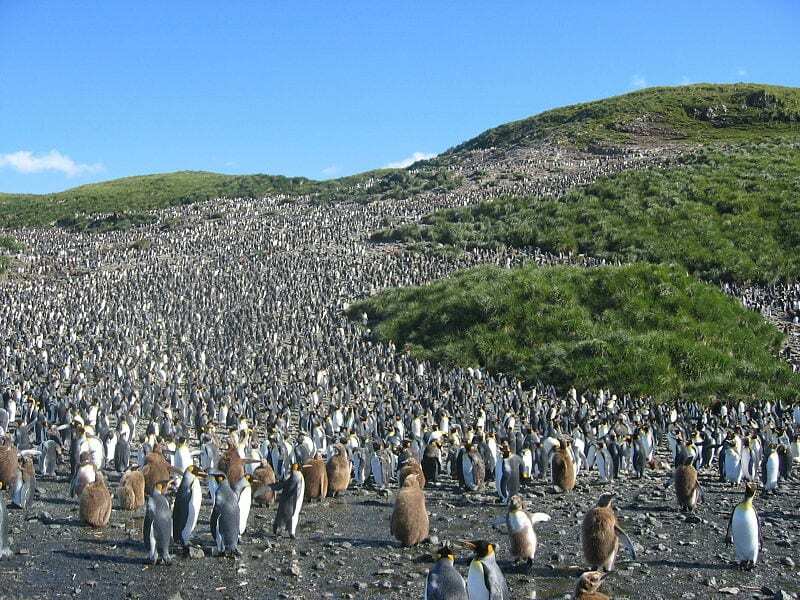 King penguin colony, South Georgia 2006. Image by Pismire; CC-BY-SA-3.0; via wikimedia commons. Males will also use their voice to attract the ladies. In a routine familiar to every Elvis fan, our king will stretch out to his full height and produce a series of deep, trumpeting calls, while bobbing and rocking his body. If he is successful, a female will join him in his dance before mating. King penguins are less monogamous than the smaller penguin species, adopting what is closer to serial monogamy: one partner per season. After courtship, which can last up to a month, the female will lay a single egg (like the one in case 82) in the height of summer (December) which she will immediately transfer to the male’s feet. The parents then play a life-or-death 54 day game of keepy-uppy, as allowing the egg to touch the frozen floor would quickly kill the chick within. The riskiest time is during the transfer from one parent to another. The adults will, therefore, leave it as long as possible before passing it to their partner. Once every 5 to 22 days is normal. After hatching the parents continue to shelter their chick until the following May. During this time they feed sequentially, losing condition rapidly (at least 30% of their body mass) to provide for the chick. Thanks to the parental sacrifice, the juvenile will grow quickly through the relative plenty of the summer. This is essential as they will not feed at all in the winter and have been recorded fasting for up to five months. 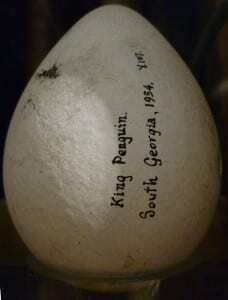 They can lose 70% of their summer body mass and so king penguin chick mortality rates are high. Only half make it to their second summer. Those that do will fledge at 14 to 16 months and will go on to breed themselves within the next two to four years.